If bringing to a party or an event, why not order additional non-framed prints to post on the wall. A truly novel gift, this personalised spoof newspaper cover is presented in either a tube roll or a contemporary black frame. The colourful cover comes in A3 size. You can read how the story will go underneath. To order, simply complete the personalised details and click add to cart. NEW - Next working day delivery for this novel gift now available. If bringing to a party or an event, you can also order additional non-framed prints. The date field refers to the date of the newspaper print. Headline: JENNY AND JOE VOTED IRELAND’S COUPLE OF THE YEAR! The red carpet is rolled out and waiting, and the champagne on ice in Killarney tonight in preparation for the arrival of Jenny and Joe to the gala event of the year. Ryan Tubridy will host tonight, as the happy couple spend the evening with their many friends and families. RTE will broadcast live, and is believed to have paid over €1,000,000 for exclusive rights to interview Jenny and Joe after the show. All private helicopter companies have been fully booked up for weeks, in order to jet in the elite of the world to Killarney. Bono is believed to have cancelled U2’s American leg of his tour to attend tonight. Other special guests will include Johnny Depp, Kylie, William and Kate and all the members of One Direction. 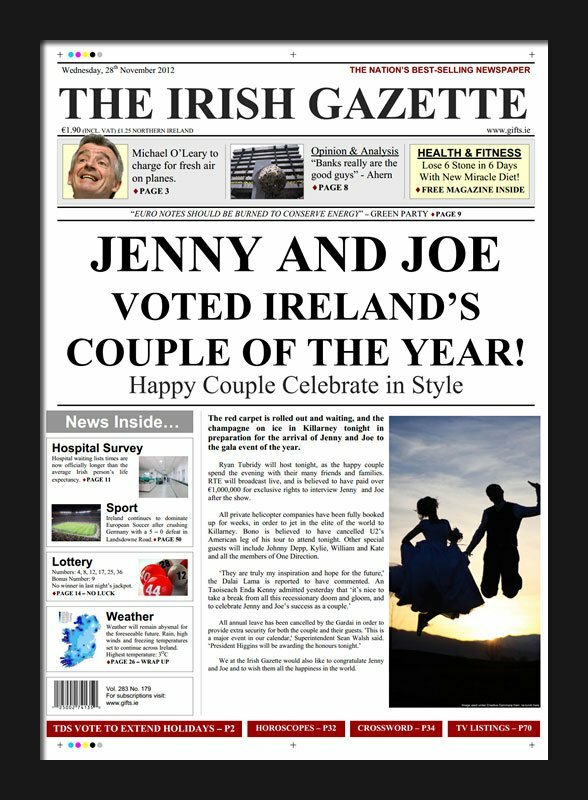 We at the Irish Gazette would also like to congratulate Jenny and Joe and to wish them all the happiness in the world.